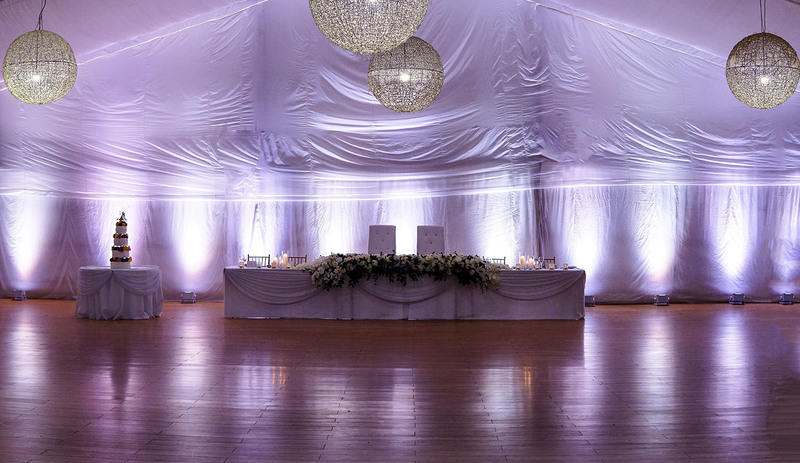 WHAT IS 'UP-LIGHTING' AND DO I WANT IT AT MY WEDDING OR EVENT? 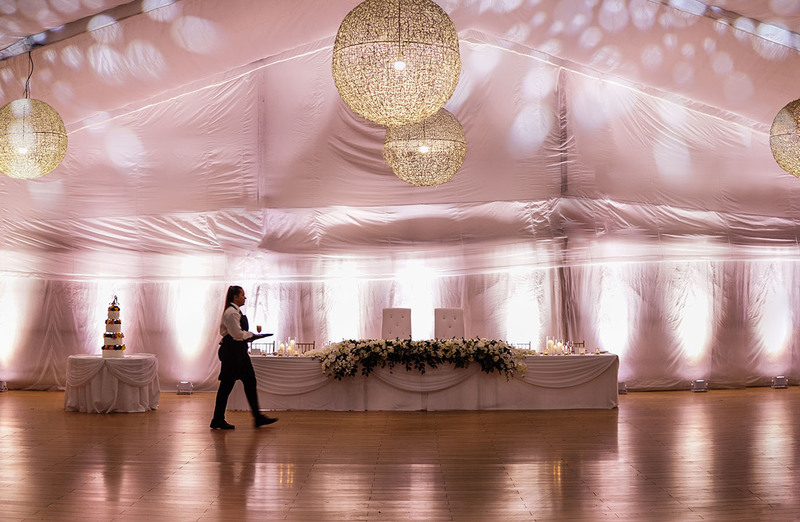 Customised lighting can make all the difference to the design and style of your wedding or special event and is a big part of how we create atmosphere. There are so many types of event lighting so here we take a look at one of the lesser known types, 'up-lighting'. In it's most common form, up-lighting involves the use of multiple small, LED lighting units placed on the floor strategically around your room or event space, which throw a wash of light upwards onto the walls or feature you are trying to highlight. These lights can really enhance the ambience of an otherwise drab function room, or really highlight special architectural features, such as brick walls, columns or arches. With most professional up-lighting companies, they provide high quality colour mixing features which means you can literally pick any colour to suit the style. You can go with a soft, more natural colour like soft whites and light peaches, or add some drama with a softly glowing purple colour. Below are a couple of images at functions we have worked of the lovely Distribution Lane in Fremantle, WA. The venue has a 50m lane way through which you enter the venue, which then leads to a larger area at the rear. As the lane way is such an important part of the venue which provides a potential space for guests to mingle and relax, up-lighting has been used here to create an inviting atmosphere. The soft white up-lighting and magenta/purple up-lighting below show how create quite different looks with the venue. With weddings in particular people are often looking for a way to add a unique touch to thier setup while creating a beautiful environment. Other types of event lighting such as festoon lighting and custom pendant lighting are massively on trend for weddings and for good reason, they help create such a nice warm atmosphere and who doesn't love the look of the vintage Edison globes. However some of the best events use a combination of festoon lighting and pendant lighting with up-lighting to create balance in the room, and most importantly a nice texture in the background of the event photos. 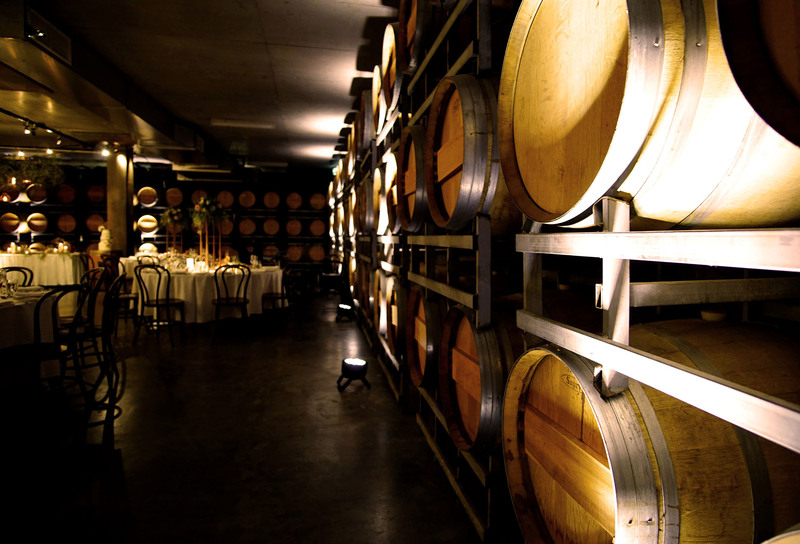 The below image is at one of the most popular wedding venues in Western Australia, the underground cellar at Sandalford Winery. Here we see up-lighting has been subtely used to provide more depth in the background, creating some nice white washes across the barrels around outside of the space. Being quite a large space, balancing the light in the room was important for this setup. The festoon lighting in the middle of the room provided a gorgeous central feature, while the up-lighting on the iconic barrel walls brought more atmosphere to the outter tables, while also providing the magical backdrop and border to the room. Up-lighting isn't limited to lighting walls either. 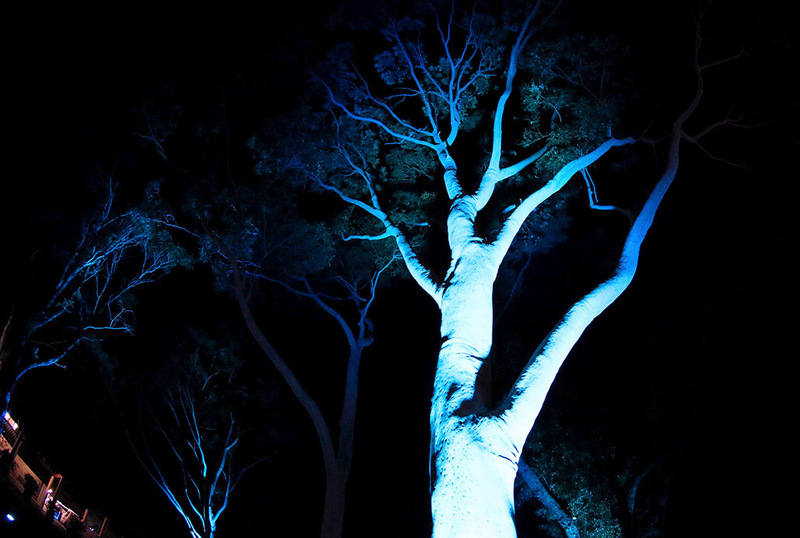 If your wedding or event is taking place outdoors, up-lighting nearby trees is an amazing effect. Under table up-lighting is also a clever way to add a 'wow-factor' to the room, especially for events with a strong colour theme. Originally up-lighting involved the use of very hot, potentially dangerous lighting units, but modern LED technology now means that they are much safer and even have the flexibility of being battery operated, thereby avoiding the need for endless cables and cords. One thing to watch out for with up-lighting hire is the type of units and how powerful they are. Over the years we have used a huge variety of different models, we find the best effect is always from the more powerful units (at least 120w of LED power) which create a nice wide, even wash on the wall. The cheaper units tend to be a very narrow "pinstripe" up the wall and are not capable of things such as under table lighting, or tree up-lighting which requires units with plenty of strength. Another factor to consider is being able to actually visualise your colour options before the day. If you have the chance to view your up-lighting units in action before the day, this will make things a lot easier to decide on a colour that suits, as images can sometimes be deceiving with filters and effects. You can then work with your lighting designer on whether a single colour or alternating colours might suit the theme or event. The below two images were taken at a Wedding in the semi-permanent Garden Marquee structure at Perth Zoo, WA. To illustrate the above point, the up-lights are set to the same colours, yet a difference in camera shutter speed and aperture show quite different colours in the image taken. The below image with the more 'peachy' soft tones is the more accurate image, which was taken with a wider apterture (which would be automatic settings on most phones on cameras in this situation). At this relatively 'blank-canvas' style venue, you can also see how up-lights were used so easily to create a beautiful feature wall behind the bridal table. The below image is one we just had to share of the iconic Fremantle Prison, quite a 'different' place for Weddings and events. As the room is quite narrow, we only required 10x units in total for a great effect. The venue has off-white walls with a very thick texture, featured in many heritage style buildings (for anyone who has heard of Perth City Farm - they are the same type of walls). 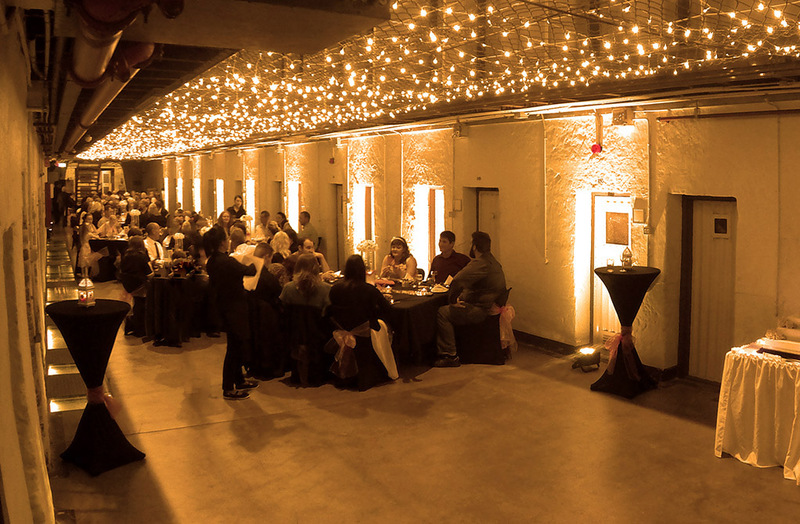 The image shows how some up-lighting down one side of the venue paired with some fairy lights overhead created a spectacular setting for the couple to 'begin the life sentence'. 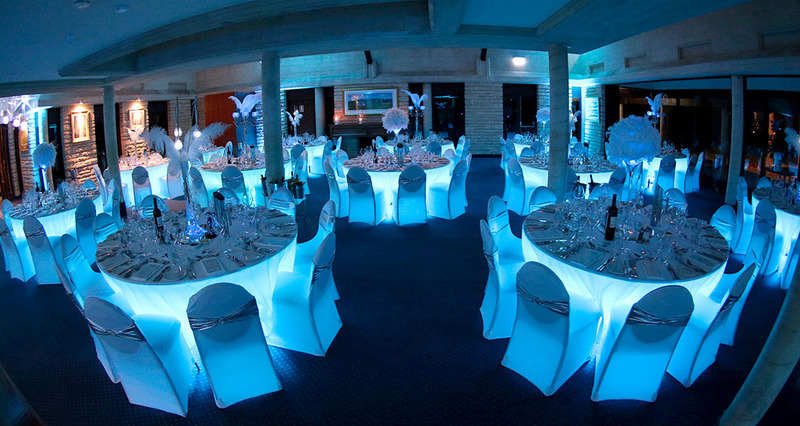 So when you are considering what type of lighting to use at your next event, should up-lighting be on the table? If you're in a venue with mostly windows and no solid walls or large pillars, up-lighting won't be very effective in this situation as glass doesn't provide enough texture to light up. If you're in a clear top marquee that also has clear sides, up-lighting won't be effective here either. For almost every other venue it should always be considered, as the benefits especially in the background of your photos are immense relative to the cost per unit. 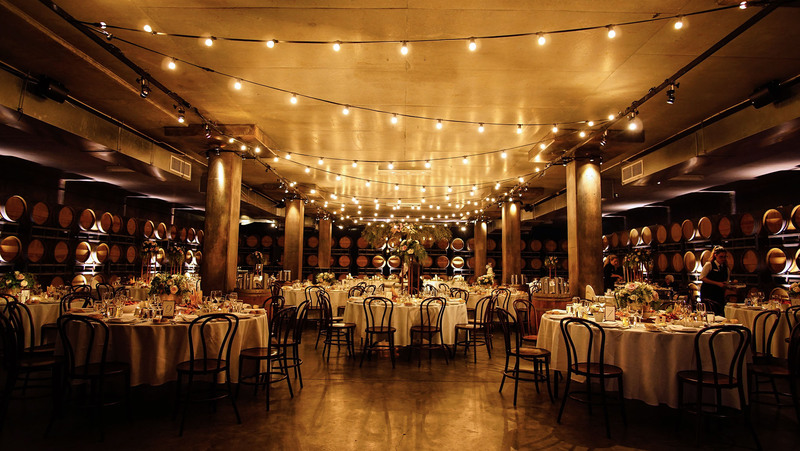 If you have a lot of festoon lighting in your venue, you may only want it to highlight a certain feature here or there. However if you have white draping, large trees, barrel walls, white walls or off-white/cream walls this is where up-lights look quite amazing. Back to the Complete Events Blog..